His passion began with diving, a small child in France with a Jacque Cousteau-type father, obsessed with the ocean. Together, they dove the Mediterranean Sea, the Red Sea, and many other seas. This love of the water grew stronger when this young boy realized he could add speed and adrenalin to his under (and over) water adventures. Shortly after the phenomenon of windsurfing, somewhere around the year 2000, kites began to dot beaches the world over – and the prerequisite could be summed up in one word…wind, lots of strong wind. 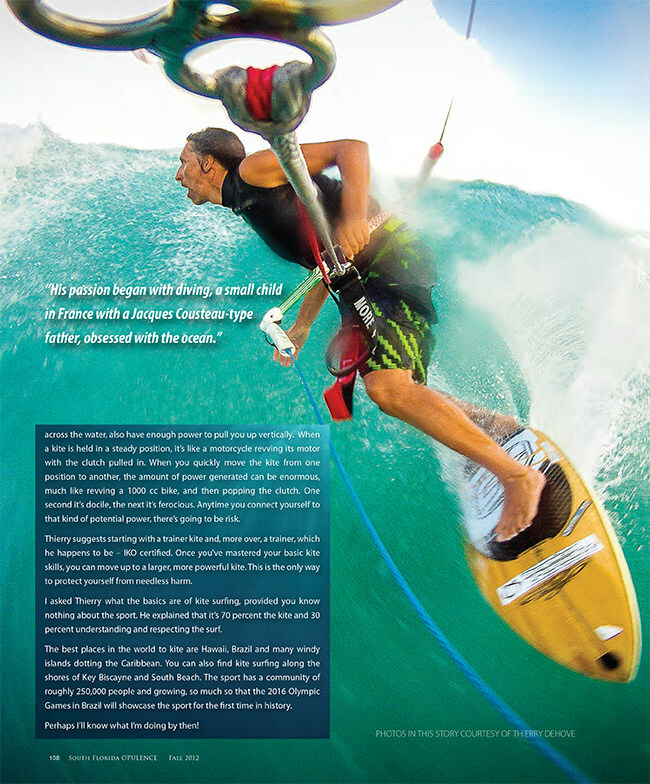 The sport attracted surfers, windsurfers, adrenalin junkies, water enthusiasts, and rich folk looking for a cool hobby, and Thierry Dehove was no exception. His first kite was a Wipika 5 m, with 2 lines and no safety system. His first board was an AHD 151 cm directional, a far cry from the equipment he holds near and dear today. Perhaps these are the lessons learned after you break your shoulder and your rib cage, a fairly large price to pay for 3 hours of fun. I asked Thierry what the attraction was, and just before he took me for a quick, heart-pumping spin on his back, which perhaps is another story all together, he explained this love affair in just one powerful word. He said it was spiritual. He said it was surfing, windsurfing, snowboarding, skateboarding and a complete sense of freedom, especially when you fly. ferocious. Anytime you connect yourself to that kind of potential power, there’s going to be risk. 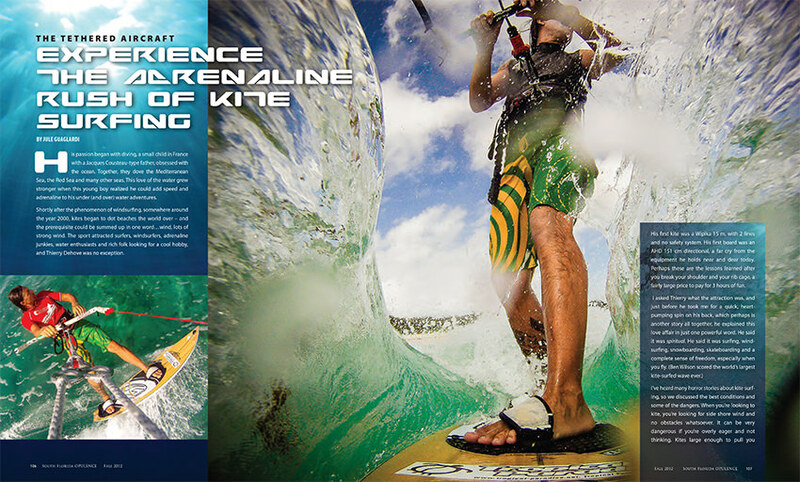 Thierry suggests starting with a trainer kite and, more over, a trainer, which he happens to be – IKO certified. Once you’ve mastered your basic kite skills, you can move up to a larger, more powerful kite. This is the only way to protect yourself from needless harm. I asked Thierry what the basics are of kitesurfing, provided you know nothing about the sport. He explained that it’s 70% the kite and 30% understanding and respecting the surf. The best places in the world to kite are Hawaii, Brazil and many windy islands dotting the Caribbean. The sport has a community of roughly 250,000 people and growing, so much so that the 2016 Olympic Games in Brazil will showcase the sport for the first time in history. Perhaps I’ll know what I’m doing by then!